For 25 years, and with no sign of slowing, violinist Chris Murphy has made a living by writing, performing and recording original music. For Murphy, the path forward is charted by looking backward, to the troubadours and minstrels of ages past. Forget the exaggerated reports of the music industry’s demise. It’s only the record industry, a relative blip in the history of putting tones in sequence, that’s suffering. Music, and the opportunity to make a life’s work out of it, well, that’s not going anywhere. “In another era,” he says, “I would have played square dances, and loved it. I would have been a court musician in Versailles in the 17th Century, or a violinist in a circus orchestra.” For Chris Murphy, inspiration spans eras and aesthetics, but the fundamentals are the same. Eventually, Murphy did as so many American adventure seekers had done before him: He sought his fortune in the West. 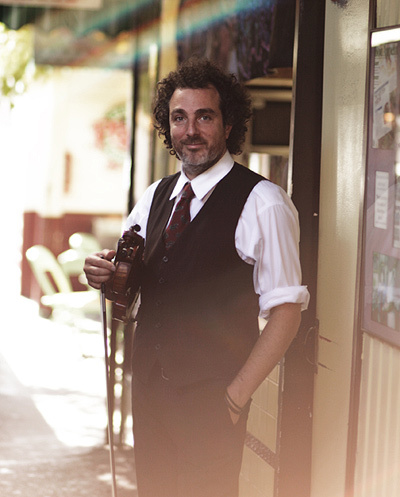 Now based in Los Angeles, Murphy earns his living by teaching — guitar, mandolin and violin — working on music for films, and, mostly, by performing his work for audiences. And that’s hardly at the exclusion of recording. To wit, Murphy has amassed a deep catalog of solo and collaborative albums and made cameo appearances on records by Har Mar Superstar and The Dandy Warhols, among others. Murphy’s recordings include the likes of Steve Hodges and Larry Taylor from Tom Waits’ band, Nels Cline (Wilco), Mike Watt (fIREHOSE), D.J. Bonebrake and John Doe (X, The Knitters), Herb Pedersen (The Desert Rose Band), Tim O’Brien, Joachim Cooder (Buena Vista Social Club), Joey Peters (Grant Lee Buffalo), Walfredo Reyes Jr. (Santana), Trevor Hutchinson (Waterboys, Lunasa) and Pat D’Arcy, L. Shankar (Peter Gabriel), Victoria Williams. In the last year alone, Murphy has written and recorded six new albums in a vast array of styles. Chris has also been featured on television programs such as ‘Til Death and The Ellen Degeneres Show; his diverse and chameleon-like talents make him a sought after composer and collaborator for film and television. Chris has also performed in over 40 US states, in England and in Ireland. As he searches for new ways to communicate through music, fusing styles and techniques from across the globe — a unique fabric of world music, he calls it — Murphy finds his element on the stage, where spontaneity and improvisation reign. “To me, the music is liquid, and I’m looking to have some kind of experience.” he says. “I’ll twist and turn and hammer and mold and shape cut and paste the music to do that. We’ve never done a song the same way twice.” As ever, Murphy re-forges the past to make a new way.